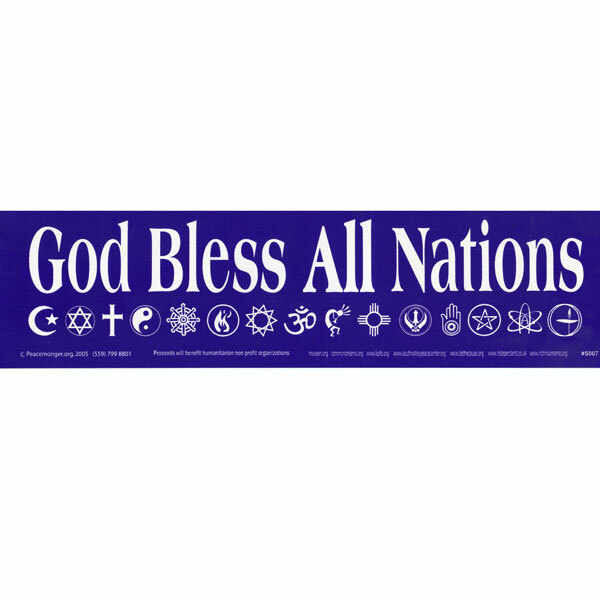 This blue bumper sticker with white lettering has a simple message to all nations of the Earth: All nations and their people are created equally, and if God exists, he certainly would not bless any nation above another. We feel this every time we see a "God Bless America!" message. In our humble opinion, many nations to which America illegally provides weapons, and especially those on whom we inflict the USA's most insidious and horrific preemptive destruction, drone attacks, and worse - those nations are most in need of 'God's blessing.' Our signature strip of fifteen religious symbols underlines the message "God Bless All Nations."